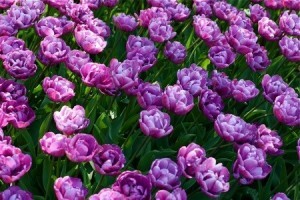 Tulips are one of the most beautiful flowers with unique colors and beautiful texture. You can use them to fill your garden in vibrant colors having so many varieties to choose from. Because tulips bloom during spring time, it means that you have to plant them during fall, making sure that the ground doesn’t freeze during the process. The blooming doesn’t stay very long as the flower of the tulip dries out pretty fast. But the good thing is that you can replant the tulips by dividing the bulbs after you assure that you have taken really good care of them. By doing this you can save money invested in new tulip bulbs and time. So, wait until the tulips bloom and just when you notice that the flower dry out, remove the seed pot that is found on the stem. Also you need to remove the dried out leaves. The procedure is called deadheading and you have to be very careful. Because of the deadheaded plants the seed pots are prevented from flowering again. In order for a bulb to regenerate and bloom again in the next season it needs to get all its nutrients. After finishing with the deadheading process, you have to leave the tulip underground for some time. In the following summer you can dig for the bulbs and get them planted in the fall. Once you have extracted the bulbs from the ground you have to leave them to dry on a piece of paper. By taking care of these things you will make sure that the beautiful tulips will grow again next year as beautiful or even more beautiful.